Birmingham has the largest population of students outside London, but is the only large university city that has no policy on student housing. 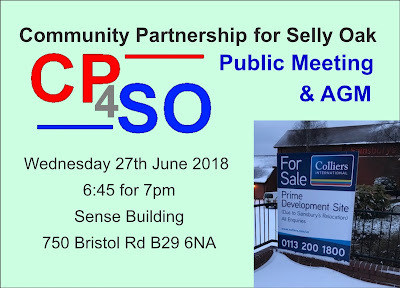 A co-operative of community groups (the Community Partnership for Selly Oak) has drafted a policy for Birmingham City Council to provide a basis for consideration of planning applications for student housing. 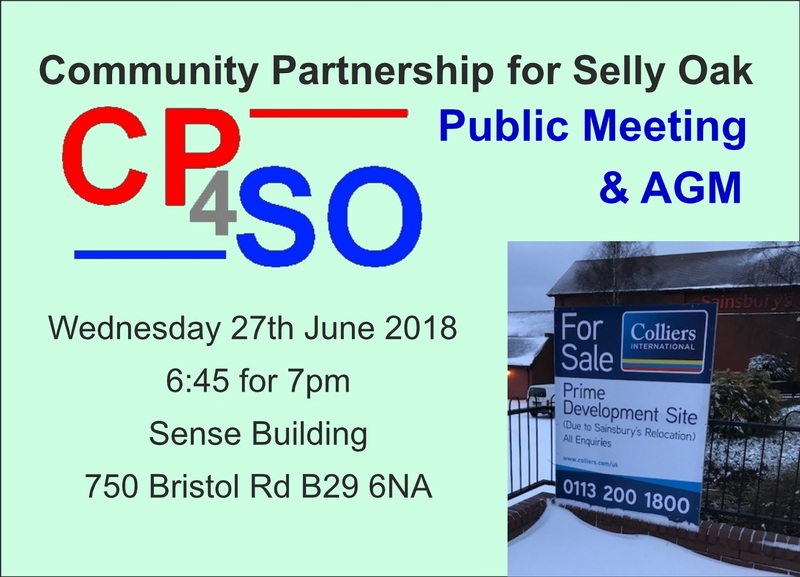 Applications are often for poor quality conversions to houses in multiple occupation (HMOs), are often retrospective where development has gone ahead without permission, or are for large blocks of purpose built student accommodation that is wiping high streets, particularly in Selly Oak. · To provide Birmingham City Council with a policy framework as a basis for approval or rejection of planning applications for student housing. 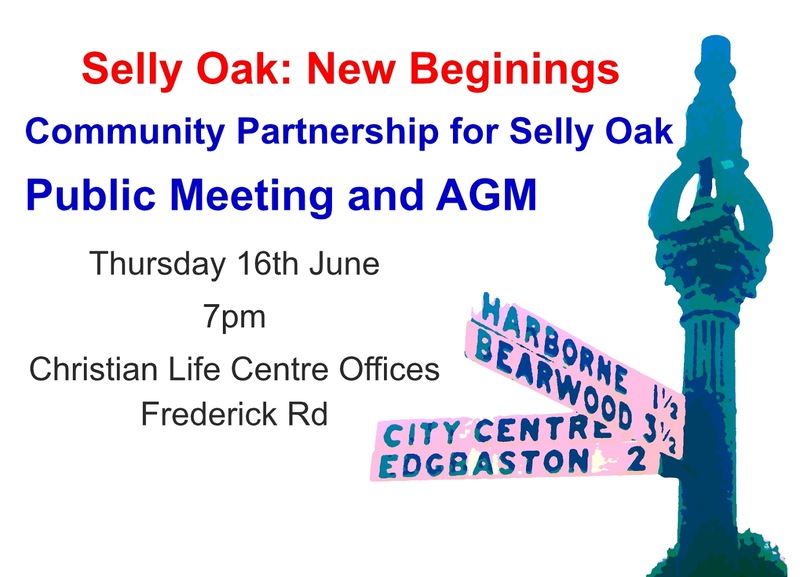 · To ensure student accommodation is provided close to universities and not scattered on random lots, or focused on one particular district – Selly Oak. · To ensure purpose built student accommodation provides the cluster flat style of accommodation that students want. · To avoid problems of affordability and possible future collapse in the market. Current purpose-built accommodation is at the higher end of the price range for accommodation, leading to problems of student affordability – particularly in the case of ‘studio’ flats. If the market collapses Birmingham will be left with large vacant buildings unsuitable for reuse without significant conversion costs. The Community Partnership for Selly Oak with local councillors have campaigned for better quality student accommodation and for its wider distribution across the city so as to avoid the blight that Selly Oak is now suffering. Selly Oak representative Coun Karen McCarthy has spoken of her fears for the area after hearing of new student accommodation plans and considers that the Birmingham suburb faces an “horrific” future as it becomes the location of choice for developers to place accommodation for students from all five Birmingham universities. Karen feels a policy on Student housing would provide much wanted direction for all impacted by student housing, including permanent residents and students suffering from sky-high rents and poor conditions. The Lapal Canal Trust are running a survey about the reinstatement of the canal. You can take part in that survey here. We are pleased to announce that CP4SO's work as a Community Organisation has been recognized with a finalist's certificate as part of the Community Inspiration Awards 2015. We were shortlisted along with 5 other groups and chosen by the judges as one of the 3 finalists. 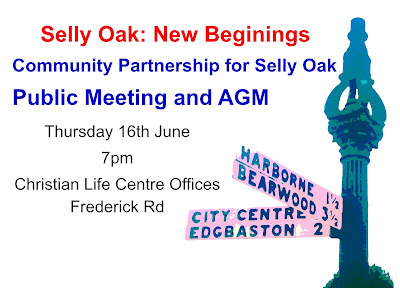 Your chance to protect Selly Oak - info here. 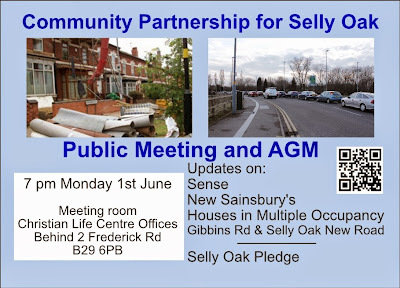 The Community Partnership for Selly Oak is an independent, non-political federation of local residents groups, organisations and individuals. We work closely with elected representatives at the local and national level regardless of their political persuasion but we have no formal links with an political party and receive no financial or practical support from any such party. Selly Oak residents who want to take a closer look at some of the building work happening at the University of Birmingham will have a unique opportunity to do so, as two of the building sites on campus open their doors as part of a national construction event on 6-7 March. The event is part of a national weekend of site openings, Open Doors Weekend, which aims to show people what goes on behind the hoardings at building sites, as well as tell them more about a career in the construction industry. At the University, both the library and new student hub sites will be opened up, free-of-charge, to anyone who books a spot to go along and take a closer look. The viewing platform on University Square at the new library site will be open to visitors from 10am to 3pm on both days, and staff from contractors Carillion will be on hand to answer questions about the work going on. The new University main Library will provide outstanding facilities for a new generation of students and researchers. It will also be a cultural hub for the University and the city, with an exhibition and event space and cafeteria open to all on the ground floor. On the same days, Interserve will be opening up the C Block of Aston Webb building, which is being transformed into the new student hub, for visitors to have a guided walking tour of some areas of the block and see how work there is progressing. The tours are available at 10.30am and 2pm on Friday 6 March and 10.30am on Saturday 7 March. The new student services hub will see the interior of the entire block of the Grade II listed Aston Webb building remodelled to house a number of student-facing teams which are currently scattered across campus. Viewing slots at both sites must be booked in advance. More information on Open Doors Weekend and details of how to book are available online.